Not all CLS PCs are able to extend their display – but the only way to tell is to try the process below to see if it works. Click to select Extend, press Enter to activate and Esc to dismiss the selector. 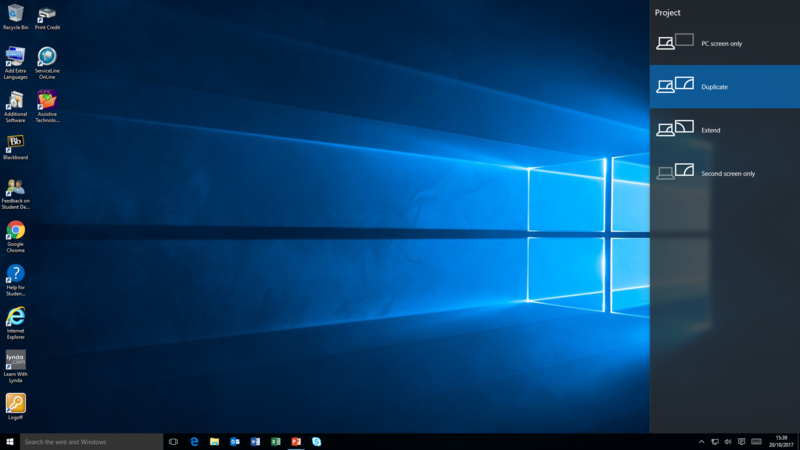 The extended screen is to the right of your main display, so as you move your mouse off the right edge of your screen it appears on the left edge of the extended display. It does take a little practice to get used to moving your mouse from one display to the other, and you may occasionally lose your mouse pointer. Tip: move your mouse decisively to the left and the pointer will be somewhere on the left edge of your main display. When PowerPoint detects an extended display, it defaults to ‘presenter view’ which uses the main screen to show your notes, the next slide and a timer while the extended screen shows the current slide. This is handy, but unfortunately causes problems with the Vevox add-in. 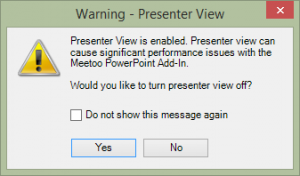 You’ll see a warning dialogue that allows you to easily turn off presenter view. Click Yes to continue. Log in to the PC and extend the display using Windows-P.
Open your PowerPoint presentation and click the Dashboard button on the Vevox toolbar to open your dashboard in a web browser. Log in using your Vevox username (your University email address) and password. Open the Vevox meeting for this lecture and start it. Make a note of its Meeting ID. 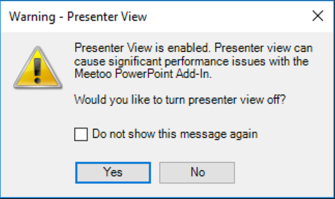 Switch back to PowerPoint, click the Connect button on the Vevox toolbar, log in (again) and enter the Meeting ID. Start presenting your slides, which appear on the extended display (facing your students). Select your web browser so you see your Vevox dashboard on the main display (facing you). Remember that you will need to move your mouse to the extended display and click to make PowerPoint the active application so you can click, press Enter or use the arrows keys to move from slide to slide. This isn’t too different to using the Vevox add-in without extending the display (steps 2-6 are standard) and it only takes a little practice to add in steps 1, 7 and 8. You’ll need to repeat step 8 (move your mouse to the extended display and click) every time you switch from using the Vevox dashboard to presenting slides. Open the Vevox meeting for this lecture and start it. Write its Meeting ID on the board for your students. Click the Projector button in Vevox, which opens in a new browser tab. Select the Projector options you want – Vevox provide more details about these options. Click-and-drag the Projector’s browser tab to the extended screen and maximise it to fill the screen. You may want to practice step 8 a few times – but it is an easy way to turn a browser tab into a new browser window. Your Vevox dashboard is now on your main display (facing you) while the Projector is on the extended display, facing your students. You can open a PowerPoint presentation and mix that with Vevox if you wish; by default the slides will be shown on the extended display. Tip: hold down the ALT key and tap the TAB key repeatedly to select the application you wish your students to view (i.e. the Vevox projector or the PowerPoint slides). Voting is normally anonymous, but your tutor may require you to create a profile (your name and surname) as you join the meeting. A Vevox app is available for Apple and Android devices. You can also access Vevox via your MySouthampton app. Vevox collects all the votes and shows a graph showing how many voted for each answer choice. You can see if you got the answer right (= formative feedback). Your tutor sees what proportion of the class got it right, and can either carry on with confidence or cover that topic again. They may sometimes choose not to show you the results and instead ask you to discuss the question with your neighbours and then vote again; research has proven this is a great way to learn. Your tutor may choose to allow you to post, view and like messages. This allows you to ask questions or make comments without having to raise your hand, speak in public or interrupt the lecture. 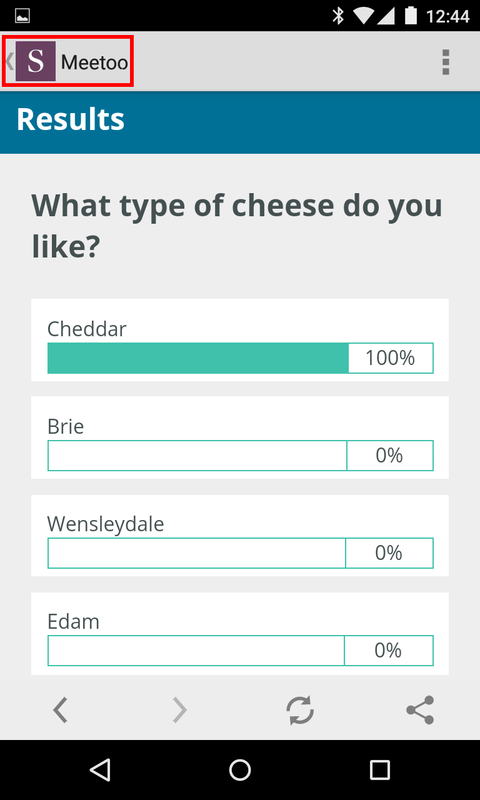 Our feedback so far is that students really like this feature. If this is unmoderated, then everyone can see every message as soon as it is posted. Please don’t abuse this freedom, or your tutor may turn messages off; try to stay ‘on topic’. Your tutor can see which questions and comments have the most likes and respond accordingly. Messages can also be moderated, which means your tutor chooses which messages are shared. What if I can’t vote? What if you can’t connect to Eduroam, have run out of battery or don’t own a suitable mobile device? It doesn’t matter, provided most students are able to vote. Just write your answer down and then compare that with the results shown on screen. If you want to ask a question you’ll have to do it the old-fashioned way. Can I run my own Vevox poll? Vevox provide excellent video tutorials and lots of online guides and FAQs. 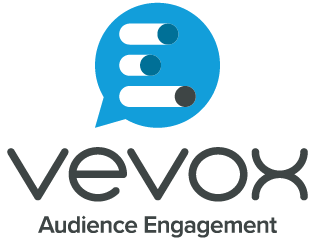 If you’re pushed for time, I recommend the Getting Started, Live Polling with Vevox and How to Display Responses. You may want to turn Messaging OFF the first time you use it – and you can always try using it once you’ve gained some experience and confidence with the basic polling. Vevox run regular 20-30 minute webinars – weekly ‘jumpstarter’ events for new users and monthly ‘case study’ events by experienced users. 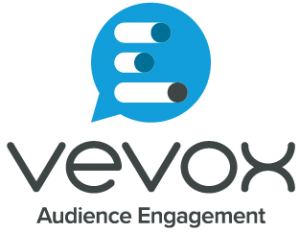 You can view all these webinars on Vevox’s YouTube channel. One key piece of advice is to always connect to Vevox using a wired connection when teaching (i.e. do not use Eduroam). This is because the Wi-Fi can become unreliable if too many devices in the room are trying to connect, and these days lots of students have two devices each, typically a phone and laptop. You can extend your PC’s display in CLS rooms so that you can view the Vevox dashboard on your main screen while your PowerPoint slides or the Vevox Projector are shown to your students on the extended screen. The Vevox add-in for PowerPoint is now available in all CLS rooms, but you may have to install it yourself. This should be a one-off process, and once installed it is available to all users of that room – but if iSolutions update that CLS PC then you may have to re-install the add-in. You can also install the Vevox add-in on your office PC or laptop in exactly the same way. If you don’t have Additional Software you can download the add-in from Vevox. If you have an Apple Mac, you can only use the web version of Vevox. The Presentation View is recommended. Start PowerPoint and open your presentation*. * If you don’t see the Vevox (or Meetoo) tab in your PowerPoint control ribbon after installing the add-in, close PowerPoint and open the Vevox (or Meetoo) shortcut on your desktop (or start menu). This should open PowerPoint with the Vevox add-in. You can also access your Dashboard via the button on the Vevox ribbon. 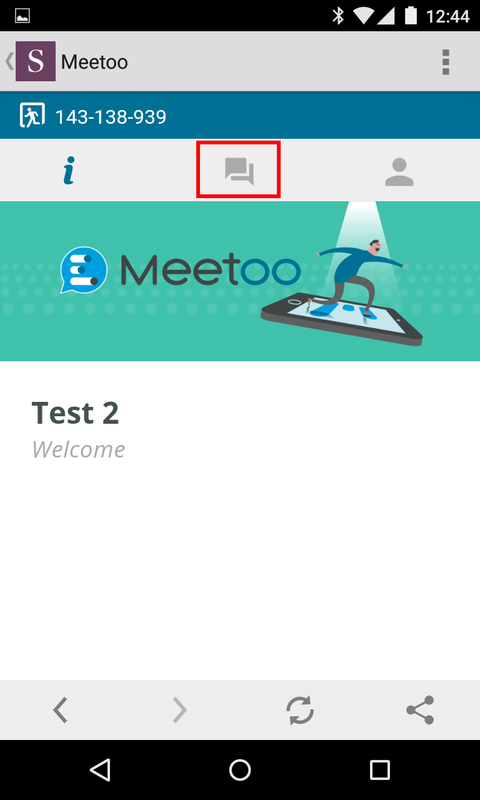 If you are using messaging, this will allow you to easily view messages posted by your students. You can turn messaging off if you don’t wish to use it during a meeting. The Vevox PowerPoint add-in is supports multiple-choice, multiple-response, rating and word cloud questions, but if you want to use free-text questions or messages you will need to use the Vevox dashboard and/or projector display in your web browser. And from now on, just a quick ALT-TAB switches you from one back to the other. It takes a little practice to master, and there is an alternative; to extend the PCs display so that you have two screens: one facing you and one projected for the students to see. Find out how to extend your display. There is a button on the Vevox tab called ‘Display options’. 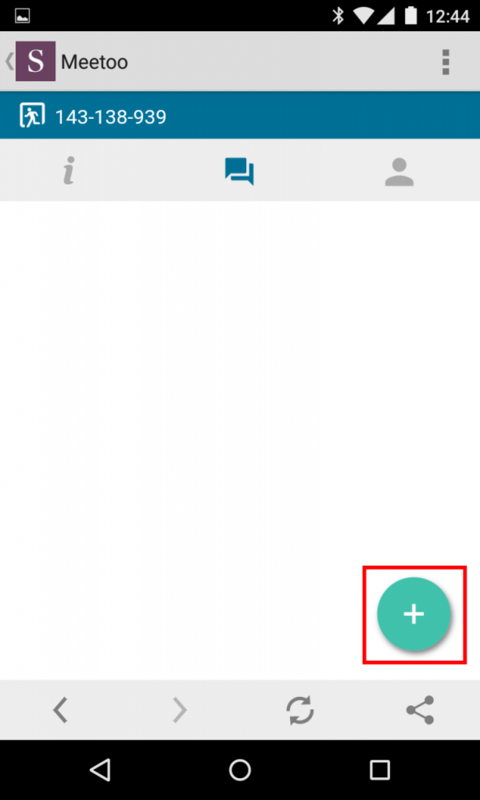 Remove the tick from the ‘Show Results’ box to hide results from the student’s view. In order to view these results, you would need to log in to the Vevox dashboard on a separate device. Vevox provide online support videos and information. If you used the Turning Point add-in for PowerPoint with clickers (zappers) the Convert to Poll option on the Vevox ribbon offers a simple way to update existing slides so they use the Vevox PowerPoint add-in. This page is archived for legacy users of Turning Point. Any new users should view the Vevox support pages. 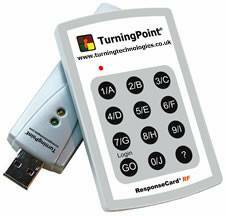 ResponseWare enables you to answer Turning Point questions shown on-screen by your tutor using your own device. You can use any modern web browser or install the ResponseWare app (iOS and Android). If you have a suitable phone or tablet we recommend you use the app. Turning Point enables your tutor to add questions to PowerPoint slides. After you vote, the class results are usually shown on-screen so you get immediate feedback about whether you chose the correct answer. Your tutor can see what proportion of the class got it right and can pay attention to topics that are problematic. Your tutor may ask you to discuss the answer with your neighbours before voting; this is a powerful technique to develop a deeper understanding of key concepts. You will be able to vote when a question is shown on-screen. We highly recommend you create a Bookmark/Favorite for the URL above. ResponseWare is an online service that enables students to participate in votes presented using Turning Point using their own internet-connected device, such as a smartphone, tablet or laptop. Special apps are available for iOS and Android devices, but students can also vote via a website that can be accessed using a standard web browser. You can have a mix of students voting using the clicker handsets and ResponseWare with their own device. For example, if you don’t have enough clickers for every student, some could use ResponseWare. Alternatively, you might have students at a remote location viewing a lecture via videoconference, and they could take part in votes by using ResponseWare. The University had 25 ResponseWare licences for individual tutors, each of which allowed a maximum of 500 simultaneous logins by students. You will not be able to use ResponseWare unless you have been given a licence and created your Turning Point account. These licences ran until the end of January 2018. In the past, we used the ResponseWare servers in the US. Data protection issues and greater use of Turning Point by European institutions have led to ResponseWare servers based in the EU, and our licences use these. This means that when you use ResponseWare in a CLS room you will need to connect to the EU server instead of the default US server. It seems that you only need to do it once for each CLS room – so Turning Point should ‘remember’ the EU server the next time you use that room. And of course, if you use your own laptop you will only need to enter the details the first time. Students who connect via an app on their phone or tablet will need to select the EU server – the student guide includes details of how to do this. Is the Server URL the default US server www.rwpoll.com ? In the Participant Options section, select Allow Guests and Do not prompt participants to enter user information, then click the Login button. At the end of the session, close your presentation and save the data if you wish to. These are given on a separate page – you should add a link to your Blackboard course and/or email your students so that they can create a browser bookmark or install the ResponseWare app in advance of its first use in class. Clickers (previously called zappers) are small handsets which enable students to answer multiple-choice questions displayed using PowerPoint. The results are instantly available as a graph for the lecturer and students to see and discuss. The data can be exported and saved using convenient Excel report formats. Hundreds of handsets can communicate with a single USB receiver. The handsets have a long range, do not need line-of-sight and have proved very reliable and easy to use in lectures. Alternatively, students can vote online using their mobile device (phone, tablet or laptop) using ResponseWare via an app or web browser. Tutors require a ResponseWare instructor licence. Note that our ResponseWare licence will expire at the end of semester 1 in January 2018 and there are no plans or funds to renew it. Used effectively, this technology has been shown to improve interaction, attendance, enjoyment and outcome of classroom teaching (Duncan 2005). Some academic units have bought their own sets, and these are listed here, along with the contact details of the person responsible for managing their use. You will normally only be able to use sets belonging to your own academic unit. Note that the Library loan service is no longer available. There is currently no scheduled training in the use of the Zappers. Turning Technologies provide many useful guides and videos, and the built-in online help is also good. A Quick Step-by-step Guide to Clickers – one sheet of A4 with all the info you need. How to Use Turning Point clickers in a Common Learning Space – this PDF set of screenshots takes you step-by-step through using clickers in a CLS. Please see our list of FAQs and their answers. Note that Turning Point version 5.3 is installed on all Common Learning Space PCs, so all you need to do is log in, plug in the USB receiver, distribute the handsets to the students, start TurningPoint, open your PowerPoint presentation and go. See this guide for details. You will need to install the TurningPoint on your office Windows PC so that you can prepare your PowerPoint presentation or add question slides to an existing presentation. Most academic staff have a Windows computer managed by iSolutions in which case you can install Turning Point from the Additional Software icon on your desktop. The only version available to download from the Turning Point websites (UK and US) is the latest one, version 8. You can only use this if you have an instructor licence. Note that these will expire in January 2018. Do not use a USB receiver with Turning Point 8 – it will update it so it can no longer be used with Turning Point 5. The Digital Learning team has some accidentally upgraded receivers you could use, but most TP 8 tutors get their students to vote online using ResponseWare. When you first load up Vevox from the app you will be asked to enter the details for room or ID that you wish to join. This is a 9-digit number that will be provided to you from your lecturer/meeting organiser, referred to as the “host” in Vevox. 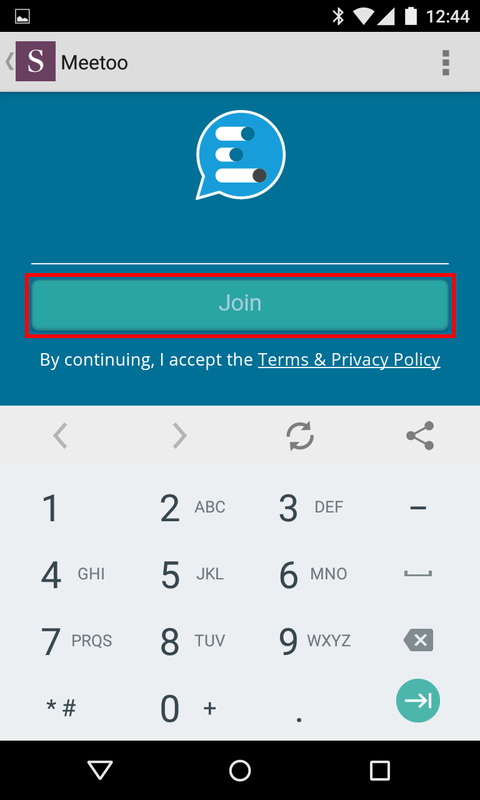 Once you have tapped on “Enter Meeting ID” your device will display a numerical keyboard. Type in the code provided to you and the “Join” button will then become highlighted, allowing you to join. 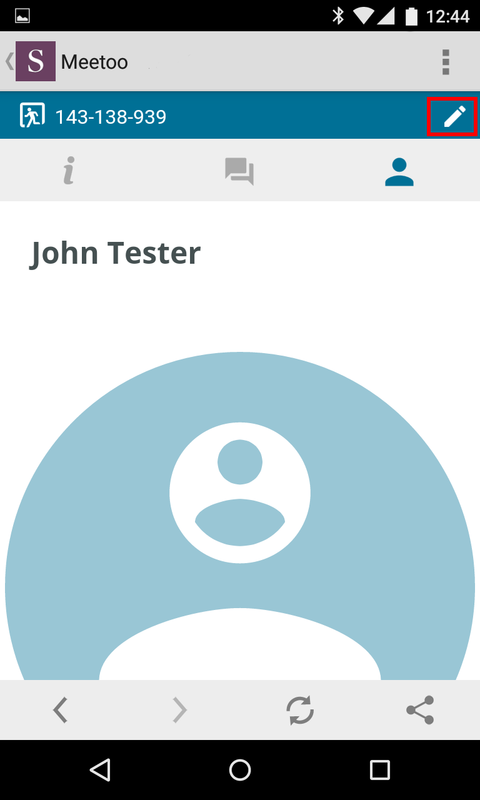 Tap on the “Join” button to progress to the meeting lobby room or enter your name page. 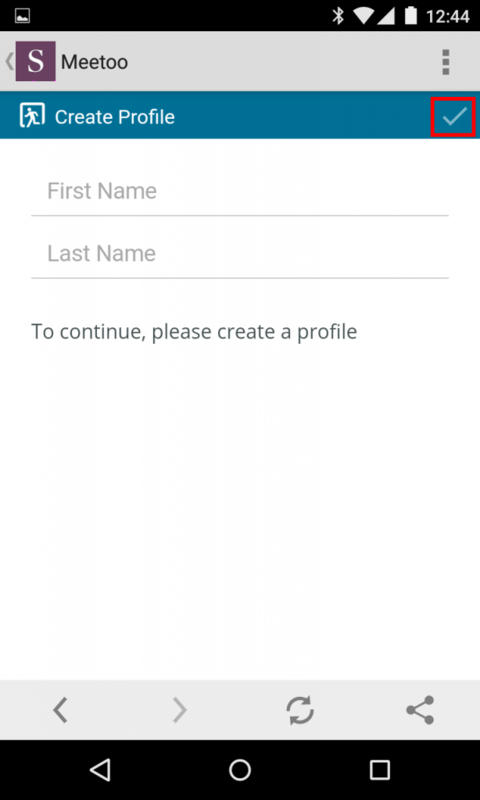 If the room has not been set to give you anonymity, you will see a “Create Profile” page. The only data that this requires from you is your first name and last name. Once entered the tick will highlight and you can tap on it to proceed. Depending on the time you join a lobby you might see holding page telling you that it has not started yet. As soon as the meeting host has initiated the polling you will be automatically taken to the next screen, therefore you can keep this page active. 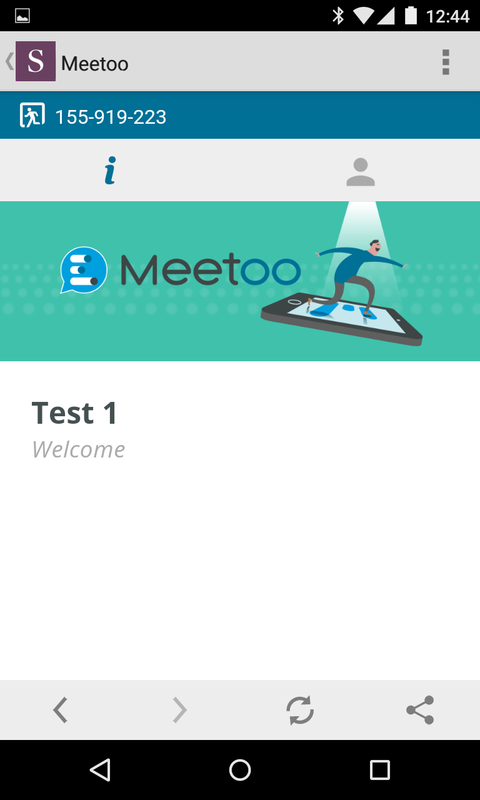 When the meeting has started you will see the introduction page, it could display a meeting name and a welcome message if the host decides to add the content. This page will be shown whilst there are no questions/polling being sent out. If you wish to check or amend your account details tap on the profile icon. If the meeting has been set up with anonymous login, then you will see the following image confirming your anonymity. 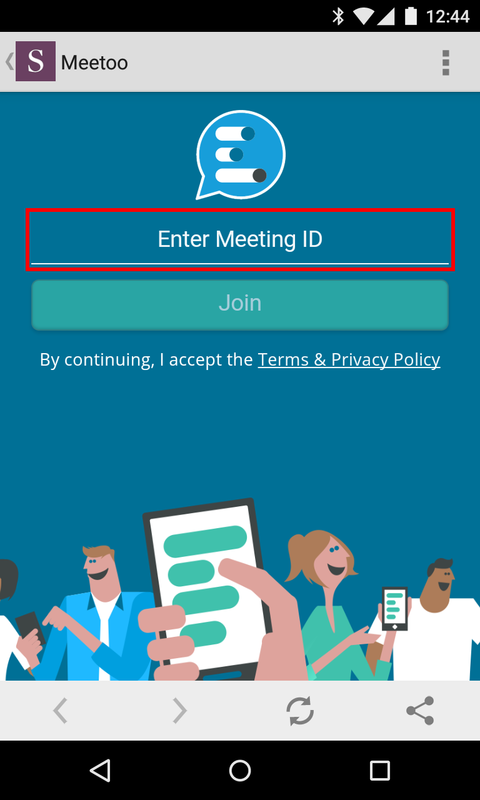 If you have been requested to give your name for the meeting, then it will display the details of what you have entered. Should you wish to change the details, then you can tap on the pencil icon located in the near the top right. From here you can then make any changes, once happy tap on the tick button to return you to the previous page. Please note: Changing your name will automatically be reflected in any answers or chat messages that you have previously made. Depending on the options selected by the meeting’s host, you may see that an internal chat room has been enabled. To go to the chat room, tap on the chat icon in the middle of the toolbar. Please note: Chat room messages can only be seen by other attendees and the host. The host can also download a report with all of the chat activity and if anonymous login is turned off, the history will correspond to who created the message. In the chat room, you will see all messages displayed sent from other participants of the meeting and the host. If you wish to say something to the room, then tap on the green add icon in the bottom right. 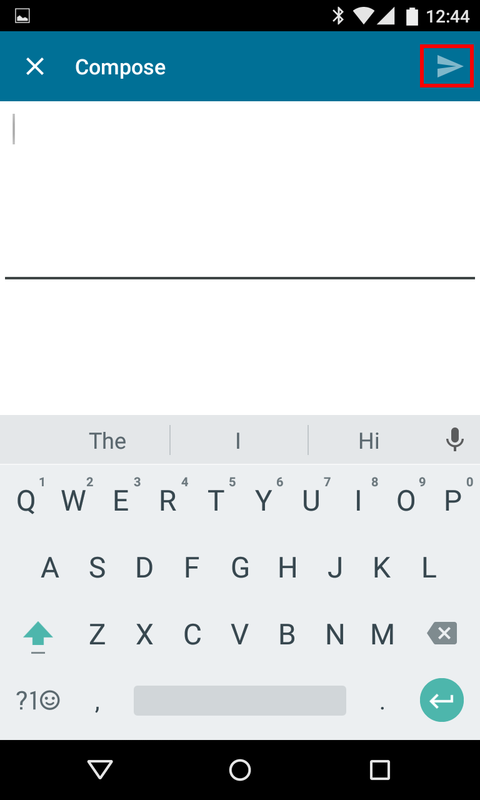 You can then start typing out your message, this can also include active weblinks so long as they are prefixed with www. or http:// Notice that when you start typing the send icon in the top right will become highlighted and once happy to send tap the button for the message to be sent for everyone in the room to see. After the message has been sent you will be taken back to the chat room where you will see your contribution as well as others. Yourself and others can also “like” messages that you find relevant and they will rise to the top. To do this just tap the thumbs up / like button next to the message. When a question is asked it will automatically take over the chat and display the polling question. 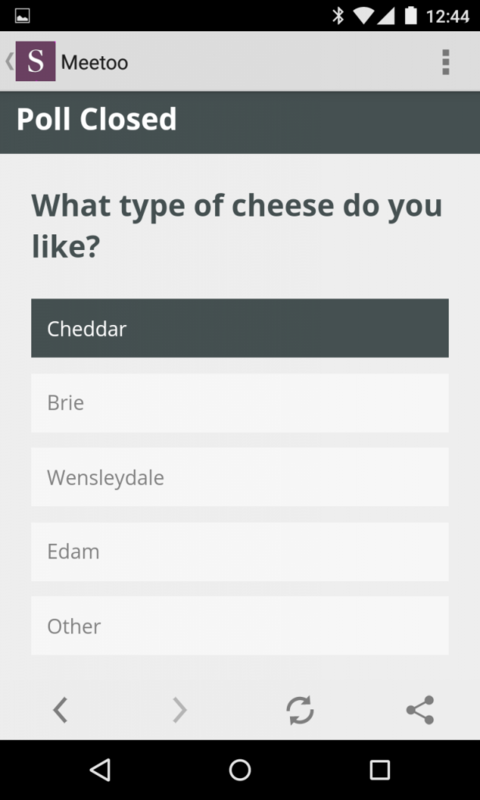 When a question or poll is asked it will take over other functionality and be the only thing you can see. 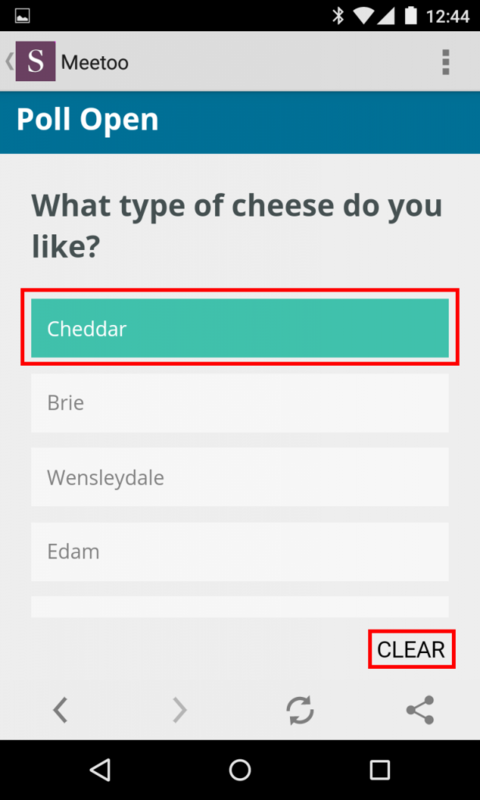 In this example of a multiple choice poll, tapping once on a response will highlight green to show it has been selected. If you wish to remove the choice, you can tap on the “Clear” button in the bottom right. There is no countdown timer and so the host should tell you when they are about to close the poll. Once closed you will be unable to make any changes to your response and the colour will disappear from the page leaving your selection highlighted in grey. Depending on your host they may also choose to push out the results from the poll, this will display on your page in full screen. Once the host has ended the session you can leave Meetoo by tapping on the MySouthampton icon in the top left of your screen and you will be returned to the MySouthampton app homepage. Vevox (formerly known as Meetoo) is a cloud-based student response system that enables students to vote using a web browser or the Vevox app on their own mobile device. 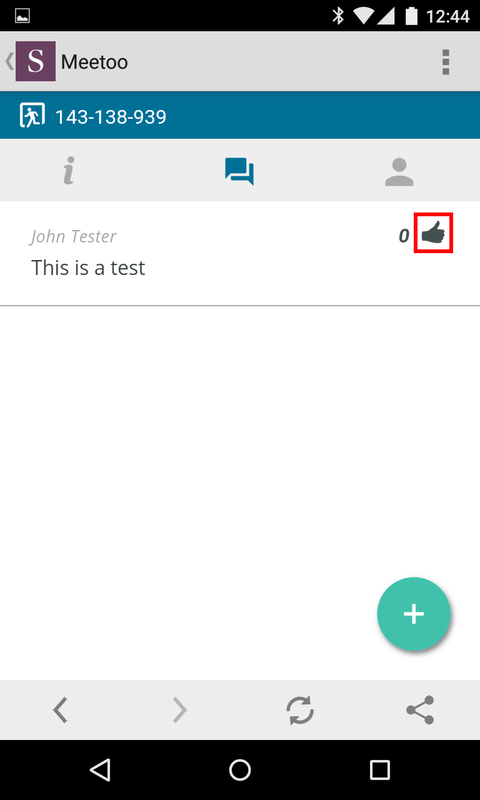 The tutor may also enable Vevox messages so that everyone can post and view questions and comments. Questions, answer options and results can be presented through a web browser by the tutor. Alternatively, they can embed questions in their PowerPoint presentations using the free Vevox add-in. A Vevox app is available for Apple and Android devices, and you can also access Vevox via your MySouthampton app. Use the University email address you will use to sign in to Vevox, for example, pq1m15@soton.ac.uk or P.Quarrel@soton.ac.uk. NHS tutors without a university email can use their NHS email. Note that you cannot use a personal email address such as phoebe.quarrel@gmail.com. Click the link it contains and create your profile and password. Advice and information about using Vevox in class. How to create and run polls and meetings. Students can answer survey questions in their own time, which makes them a great option for mid-module and end-of-module evaluation surveys. Help from Vevox includes detailed instructions. This 5-minute video shows how to create a mid-module survey and includes suggestions for the questions you might ask and some practical advice about running the survey and feeding back the results. Learn more about the benefits of mid-module evaluation. The Vevox PowerPoint for Windows add-in enables you to create and run fully integrated polling slides using PowerPoint. It is available on all CLS PCs, and also on UDE office PCs via the Additional Software icon on the desktop. Installation takes about a minute. Downloads for non-UDE Windows PCs are available from Vevox. Vevox have a useful introductory video explaining the PowerPoint add-in. If you need technical help, please contact ServiceLine and make sure “Vevox” is in the ‘short description’. If you’d like to discuss the educational use of Vevox, please contact Digital Learning. A University special interest group meets regularly. How do I start a meeting or share files in Skype for Business? Microsoft have created a handy video that shows you how to start sharing your screen and share files with attendees.